Jason Chaffetz is ethically bankrupt. The Republican in charge of government oversight wants to prohibit criticism of Trump’s ethical violations. Rep. Jason Chaffetz at a hearing on Capitol Hill on Sept. 21 in Washington, D.C. This is a man who cannot be shamed. It is going to be practically impossible for Donald Trump to take office next Friday and stay on the right side of the Constitution’s Emoluments Clause without divesting and placing his businesses in a blind trust. This fact is—with a clutch of dissenters—not in dispute. Ethics experts across the political spectrum have explained carefully what needed to be done to avoid the appearance that the president was benefiting financially from foreign gifts, payments, or favors. But Trump announced this week that he has no intention of creating a blind trust, arguing that voters don’t care about the issue and declaring that he would donate any hotel profits from foreign governments to the Treasury and let his sons manage his business for the duration of his presidency. At his Wednesday announcement, Trump’s lawyer, Sheri Dillon, disputed claims that he even has any such constitutional obligations: “These people are wrong. This is not what the Constitution says, paying for a hotel is not a gift or present and has nothing to do with an office. It is not an emolument,” she said. She added that “President-elect Trump should not be expected to destroy the company he built,” meaning, I suppose, that the normal rules don’t apply to rich presidents. (Mitt Romney was willing to divest in 2012, so maybe it’s just that the normal rules don’t apply to Trump). Most ethics experts have agreed with Shaub that the arrangement announced Wednesday is inadequate to address the conflict rules. Trump’s expectation and hope seems to be that—since the only fix for an Emoluments Clause violation is impeachment—Republicans will do as Trump has instructed and stop caring and that Democrats won’t have the nerve to raise the point that the president will—every day after next Friday—be violating the Constitution in a way that risks putting him in thrall to foreign powers. Republicans seem happy to oblige. Indeed, to the extent that the GOP has a new mantra it’s that violations of ethics rules are not legal problems but political ones. That is code for the proposition that so long as Trump and the GOP are in alignment about what is legal or unconstitutional, there will be no such thing as illegal or unconstitutional anymore. Of course, Republicans could have left it at that. But Jason Chaffetz, the head of the House Oversight Committee, has decided that not only are blatant ethics and constitutional violations now OK but also that criticizing blatant ethics and constitutional violations is not OK.
On Thursday, Chaffetz opted to go full Salem on the nonpartisan Office of Government Ethics, attacking Shaub for having done his job. The Republican threatened to subpoena Shaub if he refuses to participate in an official transcribed behind-closed doors interview. The calculus here seems to be that if nobody sees this crooked behavior by supposed ethics guardians like Chaffetz, then it didn’t happen. OGE, set up post-Watergate, is nonpartisan and advises executive branch officials on avoiding conflicts. Shaub’s five-year term expires in January 2018. Chaffetz demanded in a letter that he appear before lawmakers in the aforementioned closed-door, transcribed interview, to answer questions in a deposition-style setting. Richard Painter, who served as the ethics lawyer for George W. Bush, told the New York Times that this was “political retaliation” by Republicans against nonpartisan ethics officers for doing their basic duty. This comes just weeks after a massive public outcry led House Republicans to reverse an attempt to gut their own watchdog, the Office of Congressional Ethics. The attack on OGE has happened with a similar stealth move, accompanied by threats and bullying. Among other things, Chaffetz’s letter objects to a series of tweets by the OGE under Shaub’s direction in November. In the tweets, Shaub was sarcastically congratulating Trump for agreeing to divest from his business, which Trump has not done and will not be doing. Democrats and Republicans alike, Richard Painter and myself included, are outraged by the chairman’s demand for a closed, Star Chamber–style interrogation of Director Shaub simply because he said exactly what bipartisan experts agree upon: that Trump’s proposed conflicts solution is woefully inadequate. An even more chilling aspect of the chairman’s letter is the not-so-veiled threat to cut OGE’s funding. All of this is merely the latest salvo in all-out attack on ethics oversight. The effort to shut down OCE, the four [Cabinet] nominees who had no ethics vetting who the majority tried to ram through confirmation hearings, Trump’s flouting precedent and the Constitution in his own [conflicts of interest] plan, and now this bullying of Shaub and threat to close OGE. “It’s open season on ethics in D.C.,” Eisen added. Rep. Elijah Cummings, D-Md., the ranking Democrat on the Oversight Committee, said in a statement Friday morning that “the Oversight Committee is supposed to protect whistleblowers and independent government watchdogs like the Office of Government Ethics instead of retaliating against them for political reasons.” In a letter to Chaffetz, Cummings called for a public hearing with Shaub as the main witness, as opposed to the closed-door meeting Chaffetz is seeking. 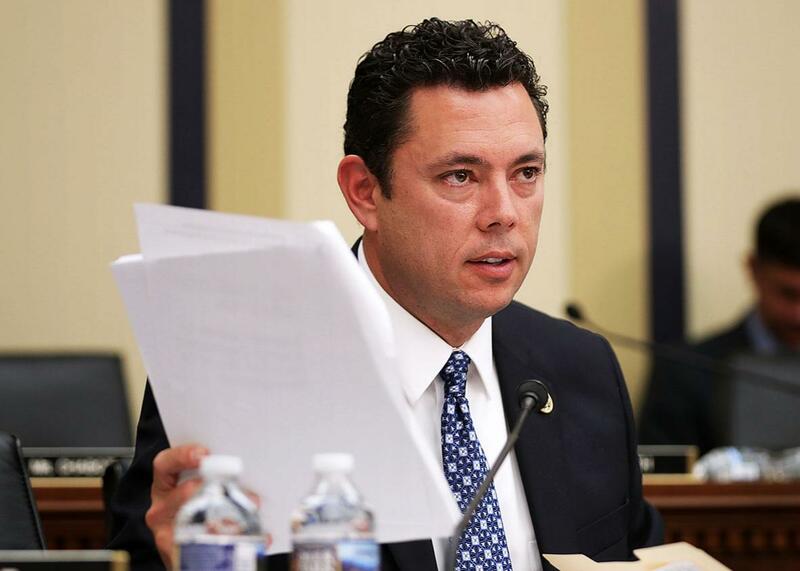 But of course, there is no shaming Chaffetz, the guy who announced that he could never again look his daughter in the eye if he endorsed Trump in October, subsequently promised to vote for Trump, and now feels the need to carry Trump’s top secret manila folders around. Walt is a talented, nonpartisan, career professional and he has been applying the same fair treatment to the Trump nominees he did to the Obama ones. Indeed, he praised [secretary of state nominee Rex] Tillerson and [senior adviser appointee and Trump son-in-law Jared] Kushner in his speech. He has cleared over 50 percent of the Trump [Cabinet] nominees who have presented paperwork at this point, versus 20 percent at this point in the Obama transition. He worked beautifully with Richard Painter and others in the Bush years, just as the Republican director of the office, Ric Cusick, worked beautifully with me when we came in. Whether it meant attempting to dismantle the congressional watchdog or gunning for the independent ethics chief, it’s now clear that working in a nonpartisan fashion to try to uphold ethical norms is now prohibited in Republican-controlled Washington. You can be sure that so long as it’s ethically bankrupt individuals like Chaffetz in charge of enforcing these norms and laws, then our system will be as rife with corruption as our incoming president wants it to be.